Plastic Square & Hex Rod Stock Are Used For Gears, Cams, Bearings, Valve Seats And Other Applications Require Wear Resistance, Quiet Operation And Low Coefficients Of Friction. Plastic Square & Hex Rod Stock are made of nylon 6/6 or acetal to assure long lasting durability. Rods have a temperature range of 0°-210°F and a tensile strength of 12,000 PSI. Rods are available in the broadest size range with strong mechanical and electrical properties. Available shapes are Hex and Square. Dimensions vary. Nylon Rod Stock Have One Of The Highest Melting Points For Gears, Cams, Bearings, Valve Seats And More. 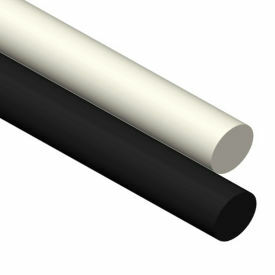 Nylon Rod Stock are extruded nylon 6/6 rods are made of nylon 6/6 to provide the strongest, most rigid rods in the industry. Used for applications that require wear resistance, quiet operation and low coefficients of friction. Temperature range is 0°-210°F and tensile strength is 12,000 PSI. Rods provide strong mechanical and electrical properties with a balance of strength and long lasting durability. Cast as finished parts and near net shapes. Diameter tolerance ranges from 0.003 - 0.05. Available colors are Black or Natural. Other dimensions vary. Plastic Rod Stock Are Easy To Machine And Have No Centerline Porosity In Copolymer Acetal. Plastic Rod Stock provides high strength, stiffness, and low moisture absorption for use in electrical components, gears, rollers and more. Rods are constructed from polycarbonate, PVC, CPVC or acetal, a semi-crystalline material with a low coefficient of friction and good wear properties, especially in wet environments, for long lasting durability. Rods have a temperature range up to 180°F and a tensile strength of 9,500 PSI. 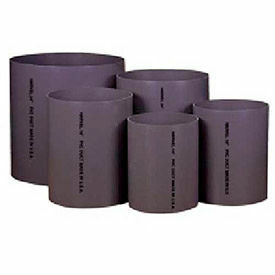 Available diameters range from 1/8" to 12". Lengths are 12, 24, 48, 60, 96, and 120 inches. Available colors are Black, Grey and Natural. Other dimensions vary per model. Plastic Rectangular Bars Provide High Strength, Stiffness, And Low Moisture Absorption For Use In Electrical Components, Gears, Rollers And More. 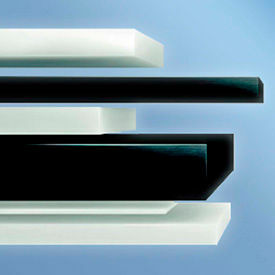 Plastic Rectangular Bars are constructed from UHMW or acetal, a semi-crystalline material with a low coefficient of friction and good wear properties, especially in wet environments, for long lasting durability. Bars have a temperature range of 0° to 180°F and a tensile strength of 9,500 PSI. Raw materials are easy to machine and have no centerline porosity in copolymer acetal. Available thicknesses range between 1/8 and 5 inches. Widths range between 1/2 - 6 inches. Lengths are 48", 96" and 120". Colors are Black and Natural. Nylon Plastic Sheet Stock Offers The Perfect Balance Of Strength And Toughness To Cast As Finished Parts And Near Net Shapes. Nylon Plastic Sheet Stock is constructed of extruded or cast nylon with good mechanical and electrical properties for long lasting durability and reliability. Nylon 6/6 and nylon 6 plastic sheets offer the highest strength and hardness for use in screw machined electrical insulators and food contact parts. Nylatron GS plastic parts maintain better fit and clearances, and have less tendency to seize as bearings. 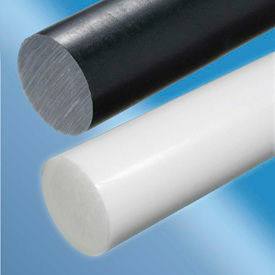 Nylon raw materials have a temperature range of 0° to 210°F for nylon 6/6 and 0° to 220°F for nylon 6 and Nylatron GS. Tensile strength is 12,000 PSI for nylon 6/6 and 12,500 PSI for nylon 6 and Nylatron GS. Available thicknesses range between 1/32 and 4 inches. Widths are 12, 24, and 48 inches. Lengths are 12, 24, 48, 96, and 120 inches. Colors are Black and Natural. 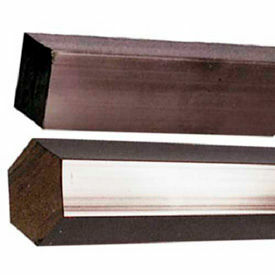 UHMW Plastic Rod Stock Have Exceptionally High Abrasion And Impact Resistant Properties. UHMW Plastic Rod Stock are made of polyethylene materials (UHMW) are corrosion resistant and provide long lasting durability. UHMW material will outwear all other materials, including metals, nylons, urethanes, and fluoroplastics. Temperature ranges from 0°-180°F with tensile strength up to 5,800 PSI. Diameter dimensions range from 1/4" - 10". Lengths range from 12" - 120". Excellent abrasion resistance, low coefficient of friction and no moisture absorption provide optimum performance. Excellent noise abatement and impact strength. Length tolerance is +/-0.250. Available colors are Natural or Black. 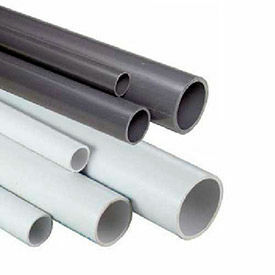 Plastic Tube Stock PVC Tubes Provide Excellent Corrosion And Weather Resistance. 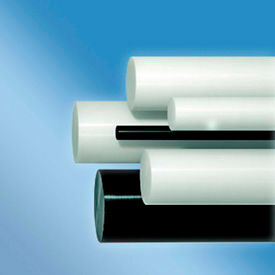 Plastic Tube Stock PVC Tubes are made of PVC or CPVC to provide long lasting durability. Used for corrosive fluid transfer in chemical processing, high purity applications, water and waste water treatment, potable water systems, agricultural, irrigation, plating, and other industrial applications. These pipes have a temperature range of 0°-140°F and a tensile strength of 7,450 PSI. Diameter dimensions range from 1/8" - 8". Schedule is 40 or 80. Resistant to most acids, bases, salts, aliphatic solutions, oxidants, and halogens. Available colors are Clear, Grey and White. Other dimensions vary per model. Plastic Duct Stock Provide Cost-Effective Solutions For Industrial And Institutional Corrosive Fume Exhaust And Drain Applications. Plastic Duct Stock are made of PVC for long lasting durability. Ducts have a temperature range of 5°-140°F and a tensile strength of 7,300 PSI. Diameter dimensions range from 6" -12". Length is 120". Ducts provide exceptional chemical resistance to corrosive fumes, gases and fluids. Seamless, large-diameter extrusions provide consistent surface smoothness, uniformity and dimensional stability. Light weight construction eases fabrication, handling, and installation. Color is Grey. O.D. dimensions vary per model. 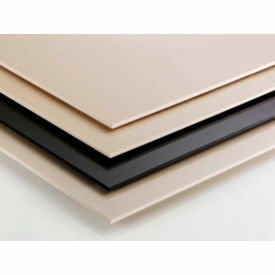 Plastic PVC Sheet Stock Provide Excellent Chemical And Corrosion Resistance For Chemical Tank and Equipment Construction, Laboratory Engineering, Exhibition Stand Design, Display Design, Ceiling and Wall Panels, and Mobility Applications. 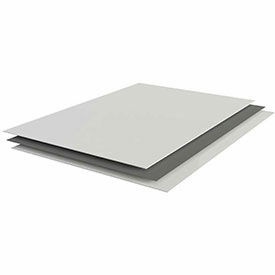 Plastic PVC Sheet Stock are made of CPVC, PVC AND PVC11. High impact sheets are easily fabricated, welded or machined. or machine. Temperature ranges from -4°-140°F. Tensile strength is 7,400 PSI. Thermoformable, vacuum formable and excellent fire properties. Available colors are Clear, Grey and White. Other dimensions vary per model. UHMW Plastic Sheet Stock Line Chutes And Hoppers Protect Metal Surfaces And Promote Flow Of Solid Materials Such As Sand, Wood Chips or Coal In Industrial Or Construction Environments. UHMW Plastic Sheet Stocks are corrosion resistant for long lasting durability. UHMW Plastic Sheet Stocks are abrasion resistant, low coefficient of friction and provide no moisture absorption. Sheets have temperature ranges from 0-180 degrees and a tensile strength up to5,800 PSI. Lengths range from 12"-120". Widths range from 12"-60". Thickness ranges from 1/16"-5". Available colors are Black and Natural.